Left Bank Books is back, but without the brick and mortar setup. Erik DuRon and artist Jess Kuronen recently relaunched the Greenwich Village book hub as an online shop with a curated inventory of vintage, collectible and rare materials. Both worked briefly at the old Left Bank Books before it shuttered in 2016. They kindly answered a few questions recently about the relaunch and what it’s been like to transition to a digital bookstore. Best of luck to the latest incarnation of Left Bank Books--be sure to visit their website here! What made you decide to relaunch online? Mostly it was a pragmatic decision. We just don’t have the resources yet to open as a brick-and-mortar shop, whereas a website was a scale we could work within creatively at relatively low cost. That said, we want to make the most of it. It’s been an interesting experiment, trying to recreate the experience of browsing in a well-appointed used bookshop. Obviously the tactile element is just irreproducible, but hopefully the moment of serendipity when you discover something really cool you didn’t know you were looking for but then just have to have is there. What kind of books do you specialize in? Broadly speaking, books in literature and the arts - antiquarian, modern and contemporary. Jess is an artist and I’m a writer and we’re both interested in process. Our inventory reflects that and is geared towards people in creative professions, for whom books are a resource, personally and professionally. The old Left Bank was very much a hybrid used-and-rare bookshop and we want to maintain that, but for all the well-known reasons the sad reality is there’s just less of a viable space these days for the kind of general used bookshop I grew up frequenting in the city. Still, it’s important to us to be accessible to people who maybe don’t necessarily identify themselves as rare book collectors, in terms of price, but also in terms of selection, and how we present our books. Hopefully the material is fresh, in that it’s not what you expect to find in a rare bookseller’s catalog, or we have something new and insightful to say about it. We want our books to bypass the rational mind that says I don’t have room for one more book and speak directly to your reptilian brain. How’s business been since the relaunch? I won’t lie, it’s been slow. When the old shop closed in spring 2016 there was a big outpouring of grief and frustration in the neighborhood, so we were pleased when we announced the relaunch at the show of love we got. But at any given point in the day fewer people are likely to “stop by” a website to see what’s new, and of course you miss the crucial element of handselling that takes place in-person in a real environment. We’ve tried to recreate that online, and do a lot of individualized outreach and personal attention to our customers, but there’s no substitute for street level contact in a neighborhood like the Village, with all its characters and denizens. You’ve been selling books for two decades, were you ever involved with the old LBB? Yes, both Jess and I each worked at the old Left Bank for a year, under its third and final owner. I had been working independently from home while attending grad school, after having recently left Bauman Rare Books, where I had been a manager and worked for 14 years. Left Bank had been in existence by that point for 24 years, first as Book Leaves on W. 4th St. under its original owner, then as Left Bank on 8th Avenue under its second owner. It had always struggled, but the city was a kinder if not gentler place then and it managed to get by. By the time we got there, though, the challenges were many. In a sense we were brought in to help with a turnaround, and things were improving, but in the end we ran out of time. That’s why we want to be deliberate now that we’ve revived things under our own steam, and try to get it right. It may be next to impossible, but we want to give it a shot because we think a good used and rare bookshop has an important role to play in the cultural life of a city. What else should our readers know? Until we can scrape together financing for an open shop, we’re planning to do pop-ups, bookfairs, digital catalogs, Instagram, etc. People should visit us for updates and keep a lookout. 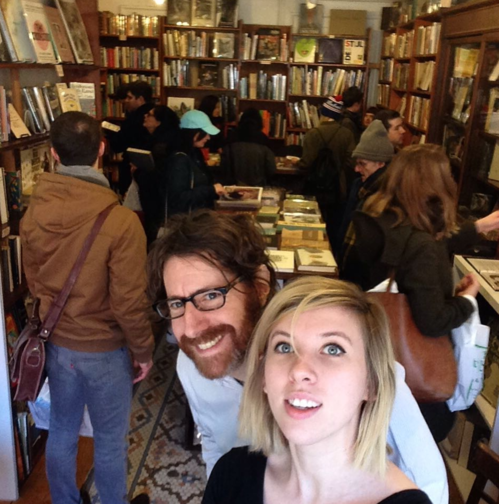 Left Bank Books is back, but without the brick and mortar setup. Erik DuRon and artist Jess Kuronen recently relaunched the Greenwich Village book hub as an online shop with a curated inventory of vintage, collectible and rare materials. Both worked briefly at the old Left Bank Books before it shuttered in 2016. They kindly answered a few questions recently about the relaunch and what it's been like to transition to a digital bookstore. Mostly it was a pragmatic decision. We just don't have the resources yet to open as a brick-and-mortar shop, whereas a website was a scale we could work within creatively at relatively low cost. That said, we want to make the most of it. It's been an interesting experiment, trying to recreate the experience of browsing in a well-appointed used bookshop. Obviously the tactile element is just irreproducible, but hopefully the moment of serendipity when you discover something really cool you didn't know you were looking for but then just have to have is there. Broadly speaking, books in literature and the arts - antiquarian, modern and contemporary. Jess is an artist and I'm a writer and we're both interested in process. Our inventory reflects that and is geared towards people in creative professions, for whom books are a resource, personally and professionally. The old Left Bank was very much a hybrid used-and-rare bookshop and we want to maintain that, but for all the well-known reasons the sad reality is there's just less of a viable space these days for the kind of general used bookshop I grew up frequenting in the city. Still, it's important to us to be accessible to people who maybe don't necessarily identify themselves as rare book collectors, in terms of price, but also in terms of selection, and how we present our books. Hopefully the material is fresh, in that it's not what you expect to find in a rare bookseller's catalog, or we have something new and insightful to say about it. We want our books to bypass the rational mind that says I don't have room for one more book and speak directly to your reptilian brain. How's business been since the relaunch? I won't lie, it's been slow. When the old shop closed in spring 2016 there was a big outpouring of grief and frustration in the neighborhood, so we were pleased when we announced the relaunch at the show of love we got. But at any given point in the day fewer people are likely to "stop by" a website to see what's new, and of course you miss the crucial element of handselling that takes place in-person in a real environment. We've tried to recreate that online, and do a lot of individualized outreach and personal attention to our customers, but there's no substitute for street level contact in a neighborhood like the Village, with all its characters and denizens. You've been selling books for two decades, were you ever involved with the old LBB? Yes, both Jess and I each worked at the old Left Bank for a year, under its third and final owner. I had been working independently from home while attending grad school, after having recently left Bauman Rare Books, where I had been a manager and worked for 14 years. Left Bank had been in existence by that point for 24 years, first as Book Leaves on W. 4th St. under its original owner, then as Left Bank on 8th Avenue under its second owner. It had always struggled, but the city was a kinder if not gentler place then and it managed to get by. By the time we got there, though, the challenges were many. In a sense we were brought in to help with a turnaround, and things were improving, but in the end we ran out of time. That's why we want to be deliberate now that we've revived things under our own steam, and try to get it right. It may be next to impossible, but we want to give it a shot because we think a good used and rare bookshop has an important role to play in the cultural life of a city. Until we can scrape together financing for an open shop, we're planning to do pop-ups, bookfairs, digital catalogs, Instagram, etc. People should visit us for updates and keep a lookout.